Cate Blanchett to Star in Tim Burton Remake of Mary Poppins? 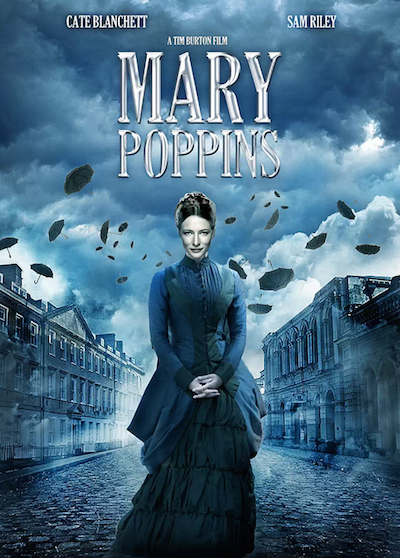 By Bryan Buttler·	 10/10/2014, 12:16 p.m.
Just a spoonful of sugar made us say “OMG” today when we heard a rumor about a Tim Burton remake of the ever popular film Mary Poppins. We love us some Julie Andrews, but can you imagine the Blue Jasmine star donning a nanny outfit with a bag full of tricks? Add the fact that Tim Burton would be directing, and we think this might be right up there with all of the hype over Maleficent. Reports also suggest that Sam Riley would be co-starring as chimney sweep Burt. Take a look at what appears to be a leaked copy of the movie poster below. Can we say “Supercalifragilisticexpialidocious”?